A movie with a pretty cool premise that just gets a little too predictable and simple minded by its end. A pretty good movie in its first half that becomes a little too conventional and convenient in its second half. This is a movie about s homeless man who gets taken in by a wealthy family and becomes their butler. The relationships are funny and entertaining, but when the homeless man starts making business deals in the later portions of the film, it just becomes a little too much. 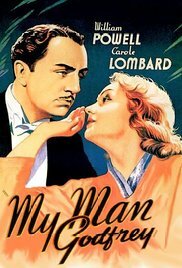 My Man Godfrey is a pretty good movie. For one, it’s got a clever storyline full of original ideas that nearly carry it the whole way through. It’s the second half of the movie that starts to lose a little steam, leading to an ending that is all too predictable. But in the grand scheme of things, what we have here is a pretty original movie about a homeless man going to work as a butler for a wealthy family, and the craziness that ensues. Godfrey (William Powell,) is what is known in this movie as a “forgotten man.” He lives under the 59th Street Bridge by the East River of Manhattan, at a dump or landfill, sharing the space with a number of other homeless men. Early on in the movie, Godfrey is visited by a cab that pulls up and has a bunch of wealthy people pile out. One of these people is a woman named Cornelia who offers Godfrey five dollars to come with her to a party. He asks her the reason for this and she says that she wants to show him off as a forgotten man that she was able to find. Taking this as an insult, Godfrey tries to push her into a pile of garbage, and Cornelia and the man she’s with go running away. Only Cornelia’s sister stays behind. This is Irene (Carole Lombard,) and she’s the young, innocent, and nice one. Irene explains to Godfrey what it is really all about and how the whole challenge is part of a scavenger hunt. She even explains what a scavenger hunt means, comparing it to a treasure hunt where people are trying to find something of value. In a scavenger hunt, she tells him, people are looking for things that nobody wants. It is Godfrey who offers to come with her, especially if it will mean that Irene will beat Cornelia in the competition. And that’s exactly what happens. The two of them show up together back in the building where the party is taking place, and Irene brings Godfrey right to the front. She shows off her forgotten man, and the judges ask him a few questions to make sure he’s not a fake. They even test to see that his whiskers are real, claiming that one year someone in the audience tried to glue them on to fool the judges. Irene ends up liking Godfrey so much that she offers him a job working for the family. That night, before taking the job, Godfrey meets Irene and Cornelia’s mother, Angelica, who is the comic relief of the film. She is constantly either drunk, laughably crazy, or both. The next morning, Godfrey gets himself cleaned up and goes to work. He begins the day at the Bullock house by bringing breakfast upstairs to each of the members of the house. With each one, he has a different experience. With the mother, she can’t remember him at all, and is unclear, after hearing it again and again, of exactly who this Godfrey is. With Cornelia, Godfrey makes it just into her doorway before hearing so much shouting and destruction that he has to turn around and come backstairs. And then with Irene, Godfrey gets a nice, pleasant welcoming. We also meet the father of the household this morning, Alexander Bullock, a tough, no-nonsense kind of burly man, who is not happy with the madness that is his home life and family. Our first time meeting Alexander he is dealing with a horse jockey who shows up at the house demanding his horse back. Apparently the mother got so drunk the night before that she stole the horse, rode him upstairs and into a room, and demanded that the horse stay with them for the night. The movie plays out as one might expect with one sister who has a heart of gold and the other one pure evil, trying to get Godfrey fired every chance she can get. What makes all of this entertaining are the two parents. The mother is such a baffoon, and she has taken on a protege, named Carlo, who stays with them and acts even more moronic than she does. At one point, Carlo does a monkey act, impersonating a giant chimpanzee, jumping from one couch to another and even hanging on the wall. It’s pretty ridiculous and funny and the father’s reaction to the stupidity is great. In the second half of the movie, we suddenly get a story about a stolen neckalce of pearls. The pearl neckalce belongs to Cornelia and she insists that it might be in Godfrey’s room. Once in the room, with a police investigator and the other members of her family, Cornelia insists that they all check under Godfrey’s mattress. Only the necklace isn’t there. And what is especially strange is the way that Cornelia reassures them all that it must be there. Clearly she planted the necklace in this location. That is the first event in the second half. The next is the discovery that Godfrey had a past that the others would not expect. At a party with other wealthy socialites, Godfrey runs into an old college buddy who has made it big. This friend of his was someone that Godfrey went to school with at Harvard. Slowly it starts to come out that Godfrey was in a past relationship with a woman and that the whole thing fell apart, driving him to give up on life and become a forgotten man. The final portions of the film involve a new problem for the family and Godfrey’s miraculous solution to this. It all seems kind of forced. The ending that bookends the start of the film, taking us back to the spot where Cornelia and Godfrey first met, only now under very different circumstances, is pretty cool. But the way that this new problem with the family arises and then is immediately resolved seems pretty contrived. On top of that, the romantic angle between Godfrey and Irene doesn’t quite work as well as the movie thinks it does. That’s because during the entire course of the movie, Godfrey never shows any interest in Irene. In fact, quite the opposite, he continues to push her away. And yet through her force and persistence, the movie goes for the usual happy ending, not realizing that it basically is showing us that Godfrey has no choice in the matter. It’s a forced ending to a movie with a great initial premise and first half, but a second half that definitely loses some of the momentum.